Gourmet food for folks who don't want to spend all night in the kitchen. Easy, good recipes. Wine pairings. Victories and defeats. I bet you thought this blog was dead, didn't you? Yeah, well -- so did I for the longest time. The technology and time required to do a proper cooking blog got overwhelming. At some point, I had to choose between focusing my time on The Naked Vine and being The Man Who Cooks. The former won out, and I think I made the right decision, considering. Just the same, I hate to neglect something I started. After three years, I needed a new angle. I think I've found one. I was reading recipes not long ago and came upon a notation on a smoked salmon recipe that said, "If you're using a stovetop smoker..."
Nothing complicated here. 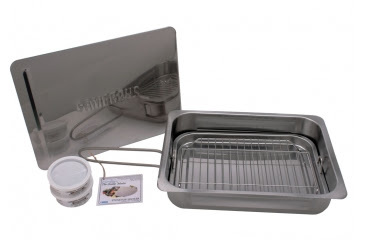 It's a pan within a pan, with a small rack that sits in the smaller pan, with a slide-on lid. Using the smoker couldn't be easier. In the bottom of the larger pan, you would put a tablespoon and a half of some very fine wood chips (that come with the smoker). You put the smaller pan on top of the wood chips, put in the rack, and put the food on top. Then, you put the whole contraption on a stove burner, crank up your kitchen fan, and put the burner on medium heat. As soon as you see some smoke, close the lid. That's it. For larger items like, say, a turkey breast, you'd tent a double layer of foil over the food instead. This isn't cold smoking, mind you. If you're looking for that particular flavor that comes from smoking meats for hours and hours, look elsewhere. But if you want to actually eat in a reasonable amount of time and still get really, really good flavor -- I gotta say, I'm a huge fan so far. There are numerous woods available, but I honestly can't tell much of a difference between them when smoking for this short a time period. For recipe purposes, the temperature in the box is around 375. So, figure out how long it would take to cook whatever you have in a regular oven and go from there. Oh -- one VERY important note. When you open the smoker, don't lean over to look in. You'll get a big cloud of hot smoke and steam in the face. You don't need that. My brother from another mother, the Wizard of Covington, turned me on to Knockback Nat's in downtown Cincinnati -- home of some of the best wings on the planet. Knockbacks smokes them instead of deep frying. Combine the marinade ingredients in a big ziploc bag. Add the wings, seal the bag, and mix thoroughly. Let stand at room temperature for 45 minutes-1 hour. Prepare the smoker as above. Arrange wings on the smoker rack. Put the smoker on the stove over medium heat. When smoke begins to rise, close the smoker and cook for 40-45 minutes. Shut heat off and let wings sit in closed smoker for another 10-15 minutes. Serve with your favorite sauce. BBQ, Sriracha, hot sauce...just whatever you like. These will go with anything. And beer. Want an index of recipes?